Four persons have lost their lives in an early morning crash involving four vehicles at Ushafa-Bwari road in the FCT, Abuja on Monday. while 13 others were injured in the accident which involved a commercial bus, a 2001 Mazda 232 car, 2004 Toyota Corolla and another Toyota Corolla. 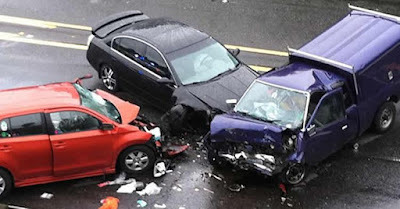 The Federal Road Safety Corps Education Officer, Bisi Kazeem, attributed the crash to dangerous driving, adding that the injured had been taken to the Bwari General Hospital for treatment, while the dead were deposited at the morgue. He explained that the FRSC personnel in Bwari and the Police got to the scene shortly after the crash and cleared the obstruction to enable free passage of vehicles. “The injured and the dead victims have been taken to Bwari General Hospital, the obstruction was cleared and traffic control handed over to Inspector Linus of Motor Traffic Division, Bwari Police outpost,” Kazeem explained.